If you’re planning on opening a bar or grill, one thing that’s going to be a must-have item is a nitrogen tank regulator for beverage dispensing (Source). A nitrogen regulator is a standard pressure control valve that reduces the input pressure from a liquid or gas that is stored in a pressurized tank (Source). There are hundreds of industrial applications for a gas pressure regulator. They range from air conditioning, air tanks to keg beer distribution. A nitrogen regulator consists of an output pressure setting, a sensor, and a restrictor all built in one body. Or a regulator may be comprised of a separate controller, pressure sensor, and flow valve (Source). A nitrogen regulator basically reduces the highly pressurized gas or liquid from the tank into a more usable form. Without a nitrogen regulator, you wouldn’t be able to control the flow of the liquid from the pressurized tank and all of it would be released at once as a result of the high pressure. A nitrogen regulator comes in a variety of styles that are all intended for a specific use in mind. There are primary nitrogen regulators, secondary and also panel models along with a combination nitrogen/Co2 regulator. For applications that include dispensing beer or wine, a primary regulator is used to reduce the pressurized contents. Secondary gas regulators are designed to further reduce the pressure from the primary regulator or gas blender to control the flow from the individual beer keg. The panel regulator is intended for use in the walk-in or large display coolers. A primary CO2 or nitrogen regulator dispenses at between 35-45 PSI and supplies two adjusted secondary regulators that reduce that pressure to 12 and 14 PSI. These regulators come in multiple styles and PSI ratings. Make sure to examine the product description for more detailed specifics. The Uniweld RHP400: This model has some drawbacks as it only goes up to a 400 PSI Delivery Pressure at maximum. But that issue aside, this is a fairly decent product at an affordable price. 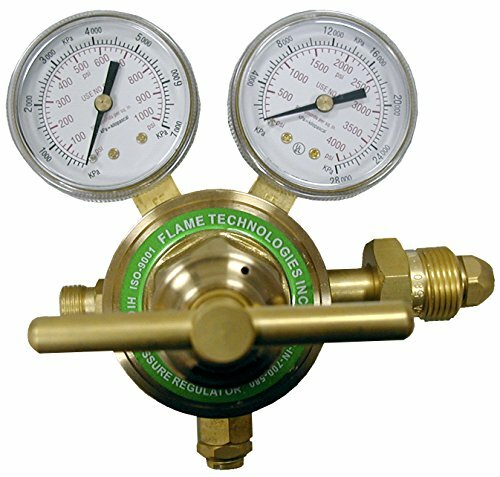 The Flame Technologies: The Flame Technologies regulator is a modest 580 PSI maximum regulator, but is designed for multiple uses. This regulator is suitable for use with nitrogen or argon gas. The Kegworks: Kegworks doesn’t provide a PSI rating for this regulator but does note that it is intended for any keg beer delivery systems. This regulator has two 2 gauges that measure in and out tank pressure. The Uniweld RHP800: The Uniweld RHP800 Nitrogen Regulator is the top of the line regulator and doesn’t cut any corners on quality or features. This regulator has a delivery system of 0-800 PSI, is well built and engineered for an extremely long life. This RHP400 nitrogen regulator offered by Uniweld is solid, well-built and affordable. 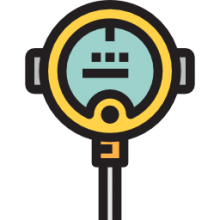 Users love that the pressure is easy to adjust, but some do note that they received a defective product. 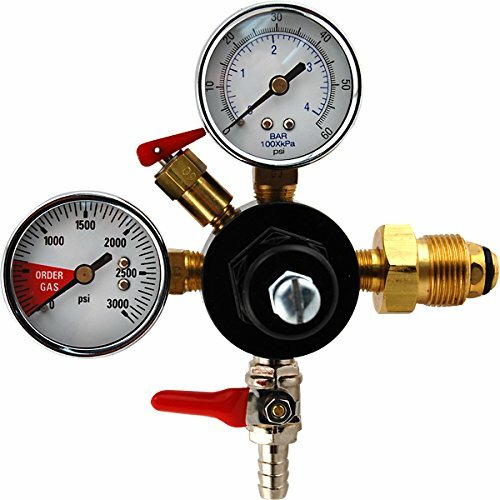 The Uniweld RPH400 nitrogen regulator measures 5.5” x 4” x 5.2”, and it features a delivery pressure of 0-400 PSI, a CGA580 inlet connection, a ¼-inch male flare outlet connection, brass piston design, and self-reseating relief valve. Another great thing about this product is that it has an easy to read 2-inch gauges in combination with protective rubber gauge boots. The nitrogen regulator also has large brass T-handle and regulator bushing. In general, users have a high opinion of the Uniweld nitrogen regulator, and they agree that it’s one of the best nitrogen regulators that you can find. A buyer comments that he has been using this device for over a year without any problems and that the housing and the threat fitting is of high quality. He adds that he gladly purchased two additional nitrogen regulators because he was very impressed with the performance. Another reviewer mentions that the regulator works very well when he turns it up to 300 PSI and that it’s very easy to connect it with your nitrogen tank. A user also notes that the gauges are accurate and the instructions are easy to understand. However, some customers have said that the valve starts to leak when you reach 350-400 PSI and that the gauges don’t read correctly. This inert gasses high-pressure piston regulator offered by Flame Technologies is well-made, easy to install, and sturdy. Users love the price and that the regulator is suitable both for nitrogen and argon, but some do note that the control valve is not designed as they expected. 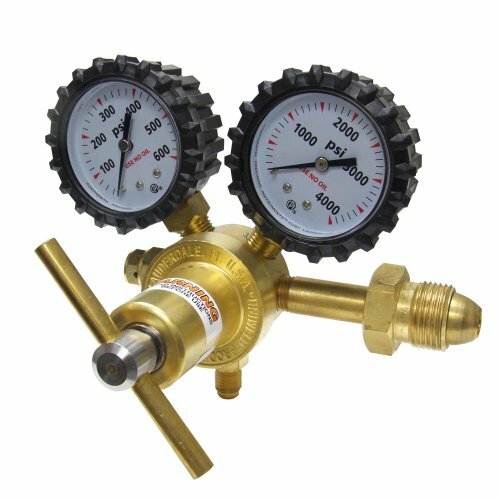 The Flame Technologies high-pressure nitrogen regulator features a delivery pressure of 50-700 PSI, a ¼-inch hose, a CGA 580 connection, and a forged brass body. Another great thing about this product is that it has a piston design for precise control and a sintered metal inlet filter for removing impurities. The inert gasses regulator also has a dual scale with two ½-inch gauges. As a whole, buyers are satisfied with the performance and efficiency of the Flame Technology high-pressure piston regulator, and they don’t have any complaints regarding its performance or functionality. A reviewer comments that the nitrogen regulator works exceptionally well and that it’s easy to connect it and adjust the pressure. Another user mentions that the quality of the high-pressure piston regulator surpasses its price and that he highly recommends it. He adds that the regulator looks sturdy and durable and that he hasn’t had any issues with it. If you need a nitrogen regulator for you draft beer system, then you might take a look at this regulator offered by KegWorks. Users love the convenient air shut-off switch, but some do note that they had some leakage issues. The KegWorks kegerator features two gauges that measure the pressure going in and out of the tank, a safety valve, a manual bleeder valve and nonadjustable shutdown, which blows off the gas at 55-65 PSI. Another great thing about this product is that the threading is compatible with nitrogen tanks. However, be aware that this is not suitable for welding purposes. A reviewer comments that the double gauge kegerator works very well and that there are no leaks. He adds that the “order more gas” section of the gauge is very useful and that he highly recommends it for anyone that brews his own beer. Another buyer mentions that the nitrogen regulator holds outlet pressure steadily and that it’s perfect for home use. He also observes that the customer support is quick to fix any issues. A user also states that the kegerator is easy to install and that it’s easy to control the flow. However, some customers have said that it’s not suitable for large N2 tanks. This high-pressure nitrogen regulator offered by Uniweld is sturdy, well-made, and easy to regulate. Users love the durable brass piston design, but some do note that they had issues with the packaging. The Uniweld RHP800 nitrogen regulator measures 5.5” x 4” x 5.2”, and it features 2-inch gauges which are easy to read, protective rubber gauge boots, a ¼” male flare outlet connection, a CGA 580 inlet connection, and a self-reseating relief valve. Another great thing about this product is that it has a large T-handle, a stainless steel pressure adjusting screw and a regulator bushing to prevent galling. In general, users are satisfied with the performance and durability of the RPH 800 nitrogen regulator, and they highly recommend it. A reviewer comments that the Uniweld nitrogen regulator is exceptionally well-built and that it’s easy to install it. He observes that the connections are leak-free and that it performs better than he expected. Another buyer states that he has been using the nitrogen regulator regularly and that he doesn’t have any issues with it. He adds that it arrived very quickly and there were no delivery problems. However, one customer says that he received two defective gauges in a row and that he is very disappointed by the quality control. If you are looking for a top-notched nitrogen regulator, you might take a look at this regulating device offered by Pro CO2. Users love that the regulator is easy to use, but they do note that they don’t know how durable it will be. 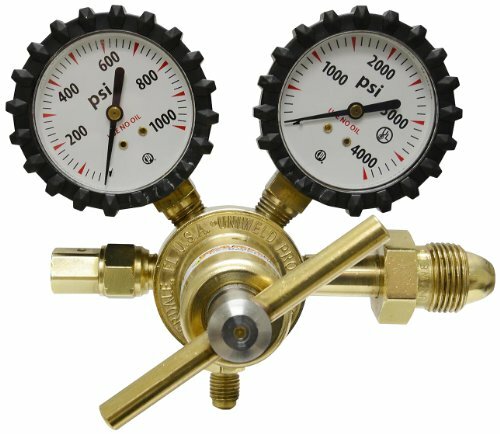 The Pro CO2 nitrogen regulator features easy to read gauges, which have a rubber bumper for protection, a large T-handle for easy adjustment, a CGA580 inlet connection, and a ¼-inch male flare outlet connection for quick installation. Another great thing about this regulator is that it’s made of high-quality brass and it’s built with efficiency and accuracy in mind. As a whole, users are extremely satisfied with the performance and durability of the Pro CO2 regulator for nitrogen, and they don’t have any major complaints. A reviewer comments that he was impressed with the high quality and that he recommends it to anyone looking for an affordable nitrogen regulator. He also notes that he has been using it up to 650 PSI with no issues. Another user mentions that the nitrogen regulator works great and that the ¼” outlet matched his hose. He adds that it’s an excellent choice for any DIY projects. A purchaser also states that he doesn’t have any complaints and that the Pro CO2 nitrogen regulator is working far better than he ever expected.